You Need A Soil Investigation Before you get too carried away with planning a basement. Only soil investigation specialists can interpret laboratory results into meaningful numbers your structural engineer can use. Your engineer can't. He needs a soil report if he is to come up with a sensible design. You need a soil report in case the ground is too difficult. If the cost of overcoming difficulties will be too great, you shouldn't go any further. The company doing the soil investigation need to know what you have in mind. Are you going close to neighbours? Are you going extra deep for a swimming pool, or will you want to pump water from a basement bathroom? Is the basement the same shape, size and position as the house above ground? 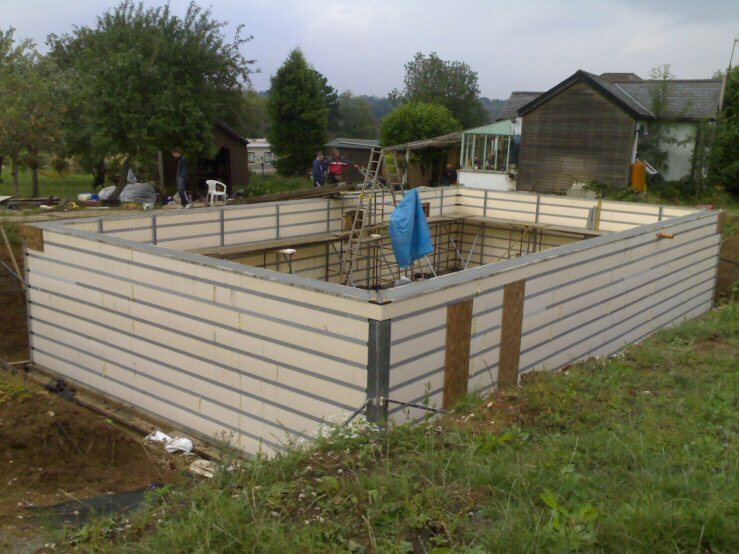 BS 8102, about protecting below ground structures against water from the ground, requires your design team to specify up to £40,000 of internal drainage if you have not found out the precise drainage characteristics of the ground around your basement (and if your basement leaks after you have built it). Go back to the previous page if you have forgotten this vital point and refresh your memory. This is something you should remember clearly. You should make sure you ask what is the best way to build the scheme you have in mind. It will cost extra but well worth knowing rather than guessing wrong. Note all the details it recommends. We agree, everything listed is essential knowledge. It will cost you dear to construct a basement without any part of it. Be in no doubt. The more thorough the investigation, the less risk you face. 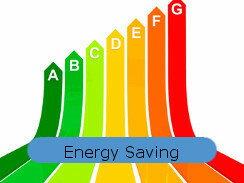 The earlier you have your investigation the more you will save on design and materials. Without an investigation, over-engineering becomes a necessity and over-engineering costs ten times an investigation. The investigation has always proven to be money well spent. Spend more on this research, not less, to bring your project cost down. One borehole cannot tell you how different strata slope unseen below ground. 3 boreholes is a sensible minimum. Imagine if you dug the hole, found a problem that you could not afford to overcome and then had to buy in material (say, £150 for each sq m dug and filled) to fill the hole again. With or without an investigation, your structural engineer's calculations have to be accepted by building control before work starts. If there are no figures for soil stability he will need to specify extra excavation, extra concrete, a lot of extra steel and probably unnecessary complication in case the ground turns out to be very poor. We have known this to be six times the steel costing six times to fix: £30,000 instead of £5,000. you cannot choose any drainage solution, neither do you know if your basement will try to float up. 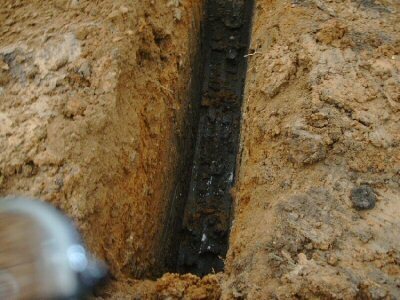 External drainage is often the cheapest waterproofing measure, but to rely upon it when it cannot cope at all times is a serious error. In flooded conditions drainage pipes deliver rain water to your basement superfast, instead of taking it away. The people who do these investigations are a bit hard to find. They seem to call themselves Geotechnical Engineers or Engineering Geologists but Yellow Pages doesn't. Yellow Pages hides them. There is an Association of Geotechnical and Geoenvironmental Specialists (AGS) who list their members. You will probably need to do some internet searching to find specialists in your local area. Therefore I have listed a number down the page. I have had a report by each of them sent to me by clients. If you would like to know more about the process, you can read the Wikipedia page: Geotechnical Investigation. The owner of this house near Silverstone dug a few feet and found dry sand and stones - perfect. So he went ahead. The land is near the top of a hill and one layer was a 'lens' holding perched water. Until the ground was dug, water flowed through the lens down the hill. After the hole was dug, the hole filled with water instead. It was unfortunate that the house was on the lowest point of this large area of land so everywhere down hill belonged to someone else. He couldn't lay a pipe. The only solution was to go down to draining material. A crater was dug for the digger, then a trench. Still clay. The crater was enlarged and another trench dug. The digger found sandstone in his third crater. 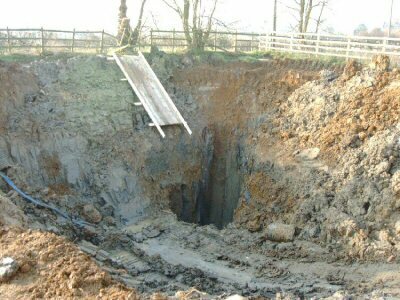 That is, after his crater was 8m deep and 20m wide. I took this photo from ground level. This customer had the space to cope with this much soil. Perhaps the operation cost £15,000. If he had to remove all the material in lorries then bring it back it may have cost 3 times that. But if he'd had a proper investigation (say £3,000) at the beginning he would have chosen a bore hole soakaway for, say £2,000 instead of carrying on the way he did with his fingers crossed. That final trench was filled with big stones to create a soakaway and a drainage test undertaken. Soakaways have to be at least 5m from the house and the level that the water goes in has to be 1m lower than the basement floor slab. 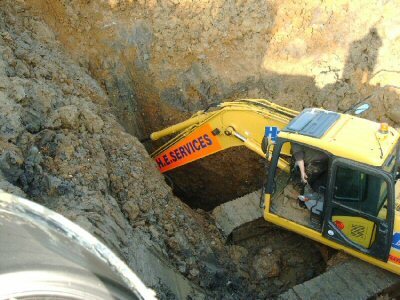 This owner, near Oxford, dug some way with his mini digger finding loose limestone until 1.5m when it turned to rock he couldn't get through. He decided to hire a sufficiently large machine with a hydraulic breaker. It took some time but the excavation was completed and the basement built. 5m from the basement he went extra deep, and right through the rock, to create a soakaway. He got through the first winter without a roof so naturally he expected the basement to be full of rain water. But during the second winter he pumped the basement out and found water coming in at waist level. 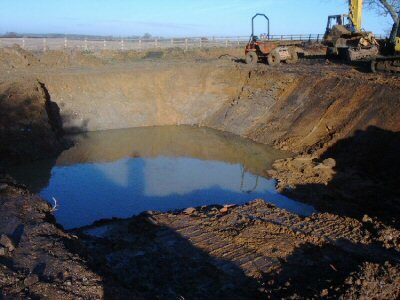 Apart from the issues concerning leaks, his soakaway wasn't working. Why? Most probably the water level rose during winter, through the hole he created and flooded the whole area whereas previously the water couldn't come up through the rock. A nightmare, yet a geologist could have known all this before he began and drainage could have gone down the slope instead. (In fact, his vibrating poker had failed on the day of the wall pour so the concrete was not properly compacted, which will be why he had leaks. But he was insured by NHBC who insist on internal drainage anyway and I understand that in the end he had to have internal drainage professionally fitted to get his NHBC warranty and it cost him an extra £8,000). This basement is on a bit of a slope. It has a ditch some way away at a lower level than the basement. The drainage around the basement perimeter was laid away at a shallower slope than the land so that it conveniently discharged into the ditch. If you find water you did not expect you probably don't have the budget to continue. You could lose what money you have spent and spend even more making safe and making good. Water is such a game changer that you cannot afford to be caught out. This wealthy customer saved money having only one borehole. It was near the other end where clay was found beneath the water-filled gravel at 3m deep and we had to dig 3.2m. Therefore it was decided to drive steel sheet piles in 5m deep and hire the frame to support the tops. But at this end, the first time the excavator went down 3.2m, the steel sheet piles facing the camera moved inwards. The gravel at this end, and therefore the water as well, is far deeper. So a second frame was needed to hold the bottom of the sheets apart where they were not deeply buried in clay, which meant everywhere since we could not see the clay. 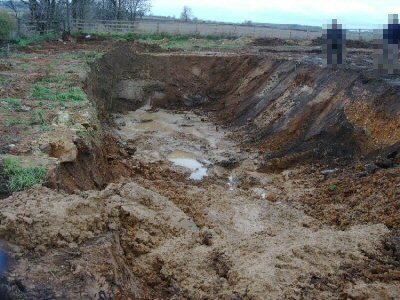 The second frame was far more difficult to use because it had to be beaten down as we went and the soil was too wet to be taken away by lorry so a small amount was piled up to drain each day. Overall the excavation took 3 times as long and cost 4 times as much. Not everyone has such deep pockets. 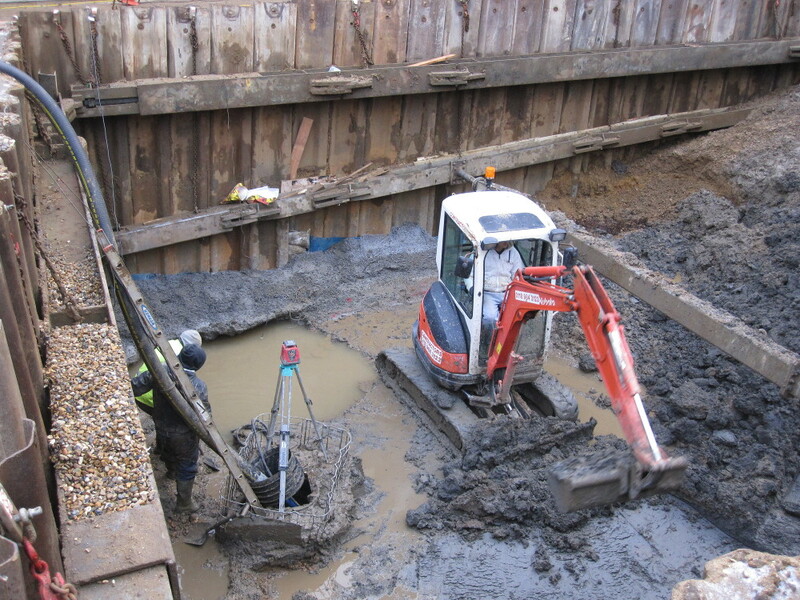 See a 19 second video showing what happens down at water level if you dig or auger, such as CFA piling, into or through the water bearing layer here. This can be what happens over great swathes of London where hoggin overlies London Clay with a layer of watery silt in between. 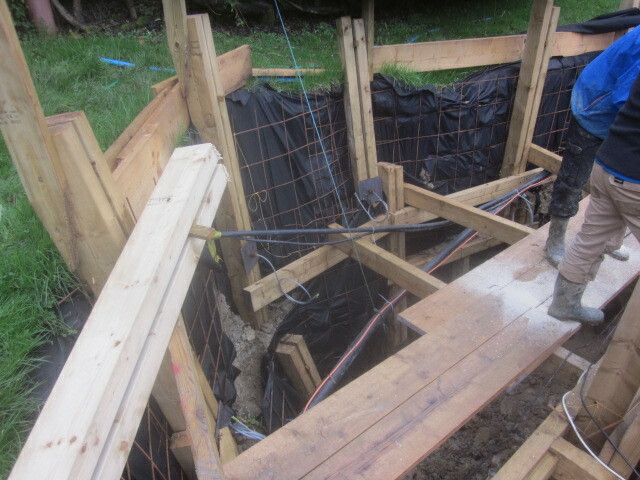 This self builder used anchors 6m deep into the ground to hold up his excavation - after it started collapsing. His foreman said they had 24 installed at £150 each. 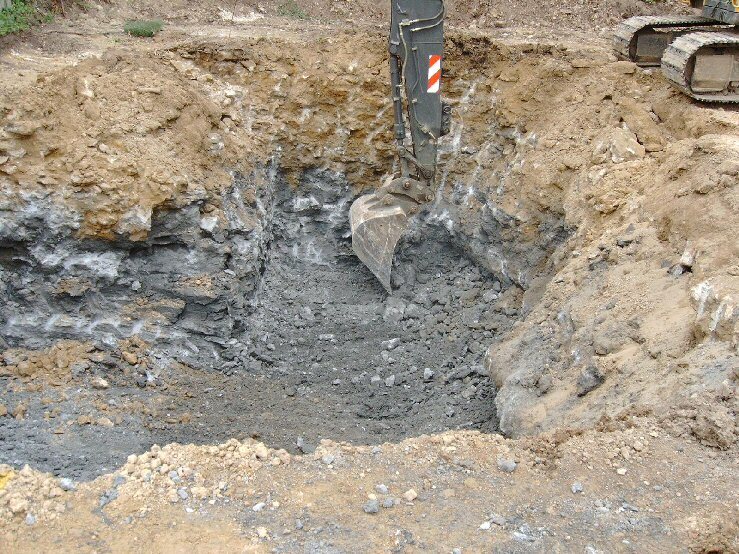 The point is that if you go ahead with your excavation before you have detailed knowledge about what is down there (or if you choose not to act upon that knowledge) you might come across a problem you cannot afford to overcome or even make good. But if you find out good quality information in good time then the chances are your structural engineer can make use of that information and design accordingly, saving you money. You might even save money on muck away too. 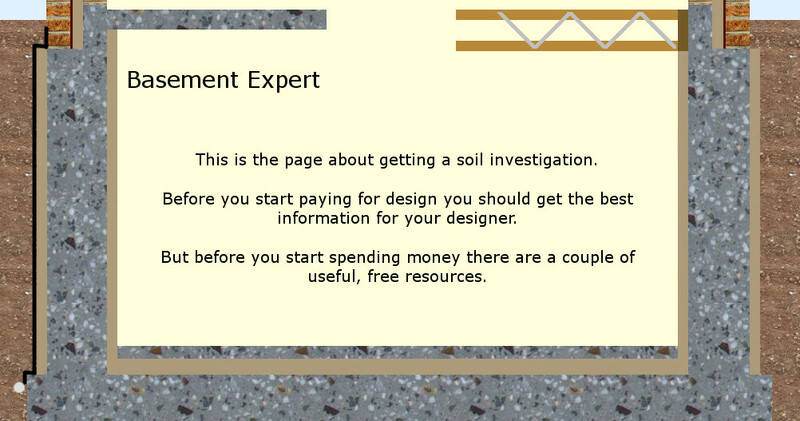 We would suggest that the average professional soil report costs about £3000 while the average structural engineer might cost about the same if he is just designing a basic basement. That total of £6000 is very quickly exceeded by any over-design or mistakes. A good quality soil report gives everyone the chance to save you money. Its cost is negligible against the greater costs of engineer, excavation, muck away, concrete and reinforcing steel. The full report relies upon boreholes being drilled and samples taken and tested professionally as well as the desk research. It would also include advice on how to build the basement you have it mind. Such things as temporary support or permanent support to hold up boundaries. A good soil report will provide advice useful to your excavation sub contractor as well. It will reduce his risk and might enable him to be cheaper. Exploratory work reduces risk. It is money well spent. 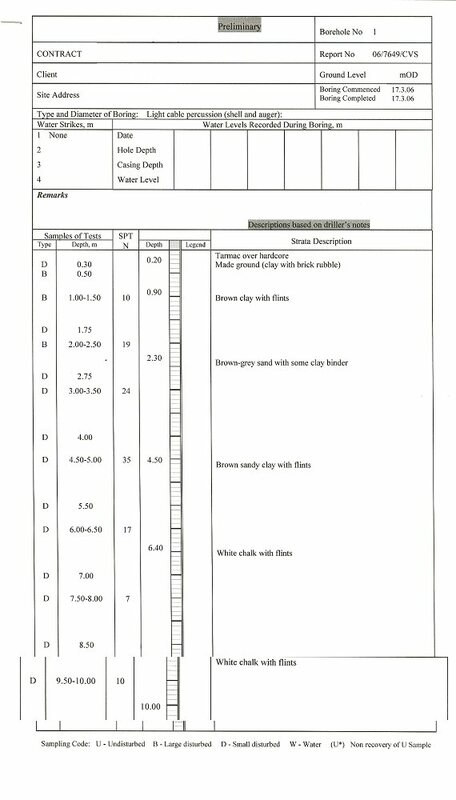 Below is a sample borehole log from a professional soil investigation company. The SPT N is a measure of the soil's strength. By pushing into the soil in a specified manner the ground's bearing capacity is ascertained. This soil is sort of average until you see that it is on chalk which is very freely draining. 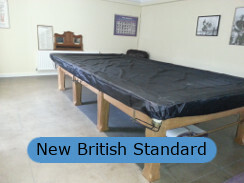 Advantageous for a basement since the structure should never suffer from huge sideways pressure from water. In this second extract (from a different log), you see that they found water at 2.30m and that their hole filled up to just 1.16m by the end of the day. In the accompanying written report, they recommended 10m deep piles to support a house structure. 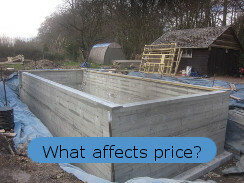 Although building a basement in this water might cost 20% more, built properly, even in poor ground, it becomes the foundation for everything and sometimes saves the cost of the piling. Constructive Evaluation Ltd, Chichester, Sussex, 01243 533499. This company appears to have several offices. 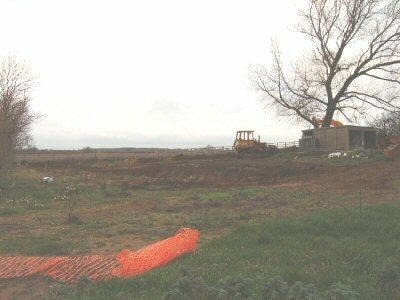 Listers Geotechnical Consultants, Towcester, Northants, 01327 860060. This company appears to have several offices. MiniSoils Ltd. This company appears to have several offices. Structural Soils Ltd, Bristol, 0117 947 1000.